Such is the world nowadays that the concept of "standing still" is gradually becoming a fleeting aspiration rather than reality. Sure, everyone speaks of "stopping to smell the roses," of "seizing the moment" or "living for today," but that’s just because they read it in an Osho paperback bought at 35% off in some airport or in an inspirational e-mail with pictures of sandy beaches and animals and the Virgin Mary. In reality though, the world of today is fast-paced, so much so that we need airport paperbacks and inspirational mails to point out the obvious. We think fast, we live fast and move fast, on from one "target" to the next, as corporate-slang urges us to. We move forward, always forward and constantly push the boundaries, desperately try to improve whether improvement is needed or not. Sadly, that business mentality has also leaked into the music we listen to, nowadays more a product of brain-storming and suit-and-tie meetings than of genuine artistic inspiration. Set targets and move forward, always forward, right? Well, thankfully not ALWAYS. In 2010, four artists decided it’s the right time for looking back and released a record of jazz standards called… Looking Back (see what I did there?!) Featuring songs by Billy Strayhorn, Joseph Kosma, Carl T. Fischer, Antonio Carlos Jobim and even one by Prince ("jazzed up" just right for the demanding ears of the "purists" who are the likely audience for this album) this is a feel-good record for any classic jazz enthusiast. 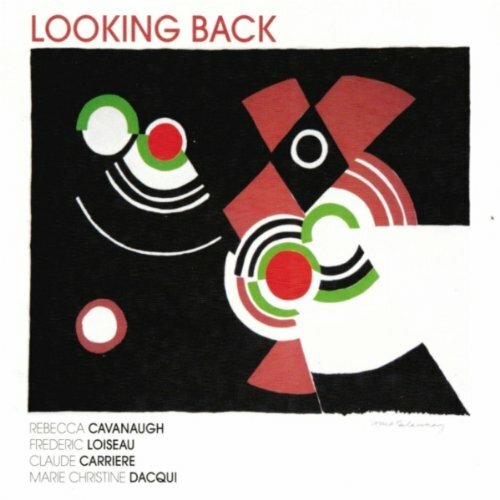 Backed-up by Frédéric Loiseau on guitar, Claude Carrière on piano and Marie Christine Dacqui on bass, charming chanteuse Rebecca Cavanaugh lends her splendid, delicate voice to breathe new life into these time-tested musical treasures. Songs like "Autumn Leaves," "Day Dream," "Something To Live For," and "We’ll Be Together Again" are revisited in a manner that is reflective without being melancholic and restrained without being apathetic. Rebecca once confessed she wished her voice were more powerful, yet I can’t help but think that it would have taken away from the charisma and emotion of this young singer. Her delivery has, in this way, a very honest, delightful, at times almost shy quality to it, changing from a timid cry of love to a sensual whisper without ever becoming overpowering or tiresome, a quality I long for in many musicians. The band is in perfect symbiosis with the singer. The stand-out is Frederic Loiseau, whose guitar is present on almost all tracks and, with its soothing sound reminiscent of Frantz Casseus, is the perfect companion for Rebecca’s low-key delivery. Voice and guitar partner up perfectly on "Si Tu T’imagines," one of the highlights of the album where Rebecca’s singing and enunciation exhibit just the right attitude for this song with her voice embraced in an almost protective manner by the sound of Loiseau’s chords. The other highlight is "A flower is a Lovesome Thing," a 1944 standard by Strayhorn, in which every tune is spot-on (Dacqui is simply magical on this one) which creates a song with a wonderfully "dreamy" quality to it that made me think of Garland’s "Somewhere over the Rainbow" or Crosby’s "Stardust." It is this wise choice of songs that makes the album stand out. Songs like Jobim’s "Dindi," Strayhorn’s "Lotus Blossom," Deniss’ "Everything Happens to Me" and even "Sometimes it Snows in April" by Prince demonstrate the diversity of sound; a gentle diversity that is never abrupt or unpleasant on the ears (God bless Tom Waits but sometimes, when his most tender ballads are followed by his loudest howls and growls you can just have a seizure). The song placement is also well thought out which adds to the aforementioned diversity, though I do question the decision of closing with an instrumental (beautiful as "Blood Count" may be). The singer’s voice is such a substantial part of the "personality" of the record that it just feels strange to not have it linger on. But nonetheless the final song does end on a high-note as Dacqui and Carriere get to shine. All songs have a very natural, very "clean" feel to them; if you close your eyes you can easily imagine that the artists are right in front of you. The album, in fact, has the aura of a live recording and many times, once a song was over, I found myself expecting to hear applause. In the midst of constant agitation and music that functions on a level of mere distraction these four musicians have put together a record that is not to be consumed but enjoyed, a tasteful invitation to stop blindly running ahead and, for a moment, to just stand still, look back and acknowledge the path that led you to where you are. This musical gem is a work to be savored at any time or place, best described by the words of Strayhorn (the record’s patron saint): "In the silent night/or in the misty light/such a miracle."